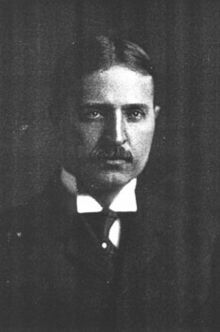 Samuel Prescott Bush (October 4, 1863 – February 8, 1948) was an American businessman and industrialist. He was the patriarch of the Bush political family. He was the father of U.S. Senator Prescott Bush, grandfather of former U.S. President George H. W. Bush, and great-grandfather of former U.S. President George W. Bush and Florida Governor Jeb Bush. Bush was born in Brick Church, Orange, New Jersey, to Harriet Eleanor Fay and Rev. James Smith Bush (1825–1889), an Episcopal priest at Grace Church in Orange. His siblings included James Freeman Bush (1860–1913), Harold Montfort Bush (1871–1945), and Eleanor Bush Woods (1872–1957). He grew up in New Jersey, San Francisco, and Staten Island, but spent the majority of his adult life in Columbus, Ohio. Bush graduated from the Stevens Institute of Technology at Hoboken, New Jersey in 1884, where he played on one of the earliest regular college football teams. He took an apprenticeship with the Pittsburgh, Cincinnati, Chicago and St. Louis Railroad at the Logansport, Indiana shops, later transferring to Dennison, Ohio and Columbus, Ohio, where in 1891 he became Master Mechanic, then in 1894 Superintendent of Motive Power. In 1899, he moved to Milwaukee, Wisconsin to take the position of Superintendent of Motive Power with the Chicago, Milwaukee & St. Paul Railroad. In 1901, Bush returned to Columbus to be General Manager of Buckeye Steel Castings Company, which manufactured railway parts. The company was run by Frank Rockefeller, the brother of oil magnate John D. Rockefeller, and among its clients were the railroads controlled by E. H. Harriman. The Bush and Harriman families would be closely associated at least until the end of World War II. In 1908, Rockefeller retired and Bush became president of Buckeye, a position he would hold until 1927, becoming one of the top industrialists of his generation. Bush was the first president of the Ohio Manufacturers Association, and cofounder of the Columbus Academy. Additionally, he was the co-founder of the Scioto Country Club, a golf club in Columbus, Ohio. In the spring of 1918, banker Bernard Baruch was asked to reorganize the War Industries Board as the U.S. prepared to enter World War I, and placed several prominent businessmen to key posts. Bush became chief of the Ordnance, Small Arms, and Ammunition Section, with national responsibility for government assistance to and relations with munitions companies. Bush served on the board of the Federal Reserve Bank of Cleveland (as well as of the Huntington National Bank of Columbus). In 1931, he was appointed to Herbert Hoover's President's Committee for Unemployment Relief, chaired by Walter S. Gifford, then-President of AT&T. He was once recommended to serve on the board of the Reconstruction Finance Corporation, but Hoover did not feel he was sufficiently known nationally. Prescott Sheldon Bush (1895–1972), a US Senator, who married Dorothy Walker (1901–1992), daughter of George Herbert Walker; he was the father of President George Herbert Walker Bush and grandfather of President George Walker Bush. Margaret Livingston Bush (1899–1993), who married Stuart Holmes Clement (1895–1974) in 1919. James Smith Bush (1901–1978), a director of the Export–Import Bank, and president of the Northwest International Bank. His wife, Flora, died on September 4, 1920 in Narragansett, Rhode Island, when she was hit by a car. He later married Martha Bell Carter (1879–1950) of Milwaukee, Wisconsin. Bush died on February 8, 1948, aged 84, in Columbus. He is interred at Green Lawn Cemetery, Columbus, Ohio. ^ Bush's obituary in the New York Times, February 8, 1948, incorrectly stated that he was born October 13, 1864 on Staten Island, New York City. ^ a b c d "SAMUEL P. BUSH, 83, A STEEL EXECIJTIVE [sic]; Ex-Head of Buckeye Casting Co. Succumbs in Ohio -- Once on War Industries Board". The New York Times. 9 February 1948. Retrieved 16 June 2017. ^ a b c Phillip R. Shriver. "A Hoover Vignette". Ohio History. 91: 74–82. Archived from the original on 2009-06-15. ^ Many sources, including Bush family biographer Kevin Phillips, erroneously state he was first president of the National Association of Manufacturers, which was founded in 1895. ^ Bush, George W. (2014). 41: A Portrait of My Father. London: Ebury Publishing. p. 10. ISBN 9780553447781. OCLC 883645289. ^ "Members of the War Industries Board Organization". U.S. War Industries Board. Washington, D.C.: Government Printing Office: 39. 1919. ^ "The President's News Conference of August 25th, 1931". The American Presidency Project, the University of California at Santa Barbara. August 25, 1931. Retrieved 2007-02-26. ^ Shapiro, T. Rees (June 26, 2010). "Prescott S. Bush Jr., brother and uncle of U.S. presidents, dies at 87". The Washington Post. Retrieved January 27, 2017. ^ Kaushik, Sandeep (October 20, 2004). "Bush relatives use website to show support for Kerry - The Boston Globe". The Boston Globe. Retrieved 16 June 2017. ^ Abcarian, Robin (18 January 2005). "An oath and a reunion". Los Angeles Times. Retrieved 16 June 2017. ^ "Margaret Bush Clement; Bush's Aunt, 93". The New York Times. 2 June 1993. Retrieved 16 June 2017. ^ "Paid Notice: Deaths CLEMENT, SAMUEL PRESCOTT BUSH". The New York Times. 13 May 2007. Retrieved 16 June 2017. ^ Archives, Manuscripts and. "LibGuides: Yale Officers: Calhoun College". guides.library.yale.edu. Retrieved 16 June 2017. ^ "Cross Family Tree". 18 December 2017. Retrieved 10 December 2018. ^ Times, Special To The New York (26 August 1959). "Banking Appointment Is Backed". The New York Times. Retrieved 16 June 2017. ^ "Trade Company Elects President". The New York Times. 17 July 1963. Retrieved 16 June 2017. ^ "Greenlawn Cemetery". Forgotten Ohio. Retrieved 2006-08-07. This page was last edited on 20 February 2019, at 14:11 (UTC).